Give your beach home that beach cottage feel with this oval braided rug. This rug is made from 100% natural jute fiber. This rug is naturally fire retardant,repels water,is mildew resistant and a very strong natural material harvested from the jute plant. Place in kitchen, bathroom, bedroom or even by the fireplace. 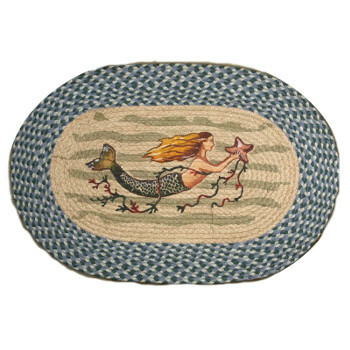 Mermaid and Seashells Rug measures 20 x 30 inches. Underwater & Coral Starfish Indoor Outdoor Rug, 26 x 60 in.